When I was making plans to visit the Alentejo, I asked Dirk Niepoort if there’s anyone he thought I should visit besides the obvious choices. He texted back a message including the name ‘Peceguina’. It’s the second wine of one of the Alentejo newcomers, Herdade da Malhadinha Nova, and so a month later I found myself checking out this new estate – I’m very glad I did. I dislike hype, and I’m aware that media folks have a tendency towards hyperbole. That said, I genuinely regard Malhadina Nova as one of the most exciting new properties I’ve visited, and I’m confident saying that this is perhaps the Alentejo’s leading estate, even though they’ve only been going since 2003, the first vintage here. It’s the baby of the Soares family, who own a successful chain of wine shops (Garrafeira Soares) and a distribution business in the Algarve. I was met by Rita and João Soares, and consulting winemaker Luis Duarte was also on hand. Luis spent 18 years working with David Baverstock at Esporão and now consults for a range of properties including Quinta do Mouro and Herdade Grande in the Alentejo. As well as 18 hectares of vineyards, this new venture has a lovely family home (the Soares clan use this as their weekend getaway - it's not far to the Algarve where they work), cork oak forests populated by black pigs, and wheat fields. The pigs deserve a special mention: they are the breed of black pig that makes the fantastic pata negra ham. 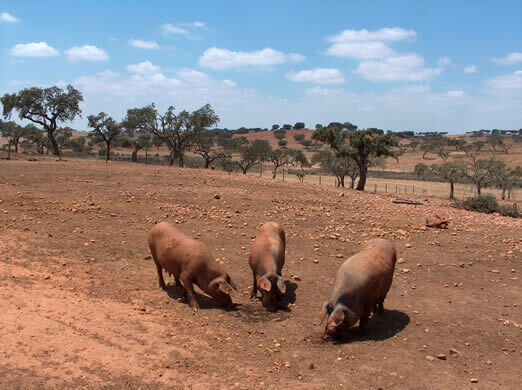 In order to qualify for this, they must be fed solely on acorns from the cork oaks, which necessitates a hectare of cork forest for each pig (they're pictured below - they are black, but covered in red dust). 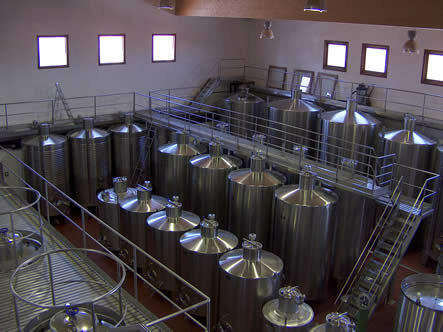 But vineyards and winery aside, it's the wines that caught my attention. They are fantastic. They're modern, but in the best possible way, showing lovely expressive fruit that still manages to retain a sense of place - these aren't dull 'international'-styled wines that could have come from anywhere. 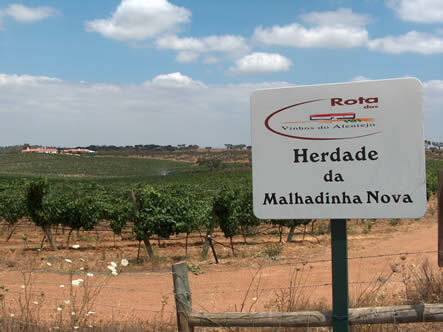 Of the 18 hectares of vineyards, 2 are dedicated to the white varieties Antão Vaz, Arinto, Roupeiro and Chardonnay. 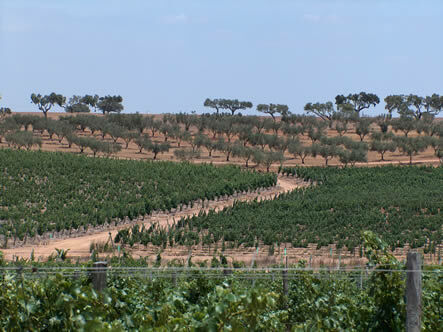 The red varieties grown here are Touriga Nacional, Syrah, Cabernet Sauvignon, Aragonês, Alicante Bouschet and Alfrocheiro. Grapes are harvested by hand into 12 kg boxes, then sorted at the winery. Each parcel is fermented separately after destemming and crushing.